Overtime giveth, overtime taketh away. Michigan State went 2-5 in overtime games prior to today, including a six-point home loss to Richard Pitino-coached Minnesota in February and an 11-point defeat against Wisconsin in the Big Ten championship game. Louisville had only played one overtime contest before this afternoon – a 10-point victory over North Carolina. 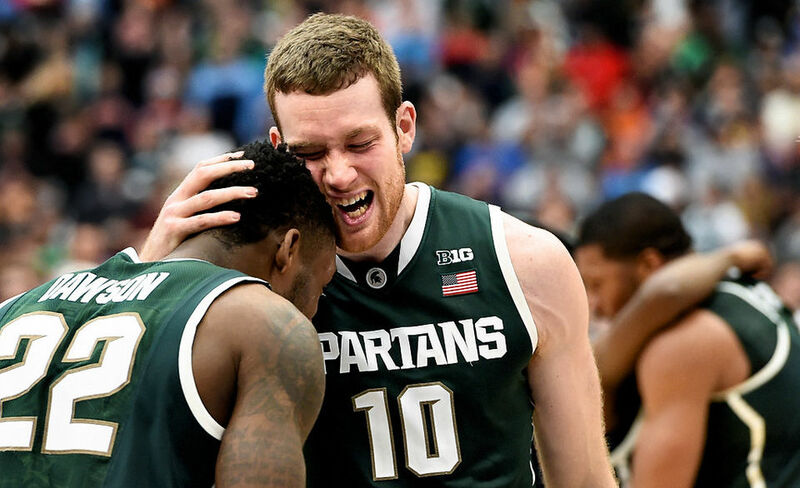 Yet, despite that recent history – with the stakes higher than ever – the basketball gods looked favorably upon the Spartans during the extra period. Bryn Forbes (14 points) knocked down a three-pointer to tip things off. The Cardinals, on the other hand, missed two early shots, including a layup. Branden Dawson found himself in perfect position for a late, game-clinching offensive rebound and putback that essentially sealed the win. “Sometimes it can be a cruel game,” Louisville coach Rick Pitino said afterward, referring to the fickle nature of bonus basketball. In another tight game with razor-thin margin for error, good fortune finally went the way of Michigan State. Michigan State clamped down in second half. Louisville shredded Michigan State’s interior defense in the first half, shooting 13-of-27 from two-point land and scoring 31 of its 40 points from inside the arc or at the free throw line. Cardinal forward Montrezl Harrell – who scored 24 points against North Carolina State on Friday – scored 12 in the game’s opening 11 minutes, helping his team grab an eight-point lead at the break. Then the Spartans clamped down. Over the final 25 minutes of regulation and overtime, Louisville shot just 6-of-32 from the field and mustered only an additional 30 points. Michigan State shut down the lane – limiting the Cardinals’ dribble penetration and collapsing on Harrell (who only scored four points the rest of the way) – and did a better job extending on shooters. That defensive stinginess enabled Izzo’s club to climb back in the game and ultimately wind up on top. Another Elite Eight thriller. As if last night’s Notre Dame-Kentucky game wasn’t enough, the Elite Eight delivered yet another thrilling finish in Syracuse today. The back-and-forth second half was filled with momentum swings and fraught with drama, including Mangok Mathiang’s game-tying free throw at the end of regulation that seemingly hung in the air for minutes before falling through the net. All told, the lead changed 11 different times and was tied on nine different occasions before Michigan State grabbed the final edge in overtime. If regional weekend is a sign of things to come, then next week’s Final Four should be nothing short of excellent. Star Player: Wayne Blackshear (28 points, 12-for-12 FT). After the game, Pitino said that Blackshear “was upchucking like I’ve never seen” at halftime – sick from his inhaler. But that didn’t stop the senior from scoring a game-high 28 points, including several big threes and a 12-of-12 from the free throw line. Even in a loss, Blackshear was by far the best player on the court for either team and the only reason Louisville stayed afloat offensively in the second half. Quotable: “No, I wasn’t planning on working this late, but God I love working this time of year.” – Michigan State head coach Tom Izzo on whether he expected his team to be playing this late into March. Sights and Sounds: Michigan State fans showed up in droves this weekend, clearly outnumbering all other fan bases on both Friday night and Sunday. Whether they factored into the Spartans’ late-game edge against Oklahoma and Louisville, we’ll never know, but the strong support certainly did not hurt. What’s next? The Spartans will face either #1 seed Duke or #2 seed Gonzaga next weekend in Indianapolis, which will mark Izzo’s seventh Final Four appearance – tying him with Pitino and Roy Williams for fourth-most all-time. This entry was posted on Sunday, March 29th, 2015 at 4:57 pm by Tommy Lemoine	and is filed under 2015 ncaa tournament, rushed reactions. Tagged: big ten, east region, feature, final four, louisville, michigan state, ncaa tournament, rick pitino, syracuse, tom izzo. You can follow any responses to this entry through the RSS 2.0 feed. You can leave a response, or trackback from your own site.